Welcome to the 18th episode of the DFB Podcast! In this episode we cover the latest Disney Food News; look back at the Disney Food Banner News from 2013; answer some leader questions (you’ll have to listen to get that joke); and reveal the answer to our Episode 17 trivia question! For this episode’s main segment, AJ and Brad discuss the highlights of Disney food in 2013. They cover some hot topics like coffee, FastPass+ technology, refillable mugs, Disney Springs, food trucks, and more. What did you like most about the year 2013 in Disney food? Hattie G.: My husband and I are headed to Walt Disney World for our 25th anniversary in March. Which 2-credit restaurants would you recommend? Ken P.: Are there any character meals at Disneyland worth booking? Which Disney princess’ father now has his name on food kiosks in both Disneyland and Walt Disney World? Send your answer to trivia@disneyfoodblog.com to be entered to win a Disney Food Blog Dining Guide e-Book of your choice! About the Picture: Do you love it or do you hate it? 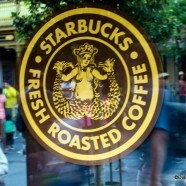 Starbucks is now brewing at the Main Street Bakery in Walt Disney World’s Magic Kingdom, and several other locations around WDW and Disneyland. More Disney in 2014! Get started on your 2014 Walt Disney World plans now! Pre-Order the 2014 DFB Guide to Walt Disney World® Dining today and receive the 2013 Guide immediately! What a steal — both editions for just $18.95! Visit DFBGuide.com to pre-order your 2014 edition and download the 2013 edition today!